Protecting eyes from injury is one of the most basic things we can do to keep our vision healthy throughout our life. 1.) Wear protective eyewear like safety goggles, full face shields when working with power tools, chemicals or while riding a bike and so on. 2.) Healthy nutrition will help to fortify and improve the eye health. Therefore a diet rich in Vitamins A, E, and C is advised. Incorporate foods like carrots, squashes, bell peppers (red or green), papayas, and tomatoes, green leafy veggies like spinach, almonds, flaxseed, citrus fruits, cherries, grapes and plums, poultry & diary products. In addition to protecting eyes from accidents, early detection and treatment of eye problems is the best way to keep healthy vision. Ultraviolet (UV) light which form a portion of the sun's rays can cause eye diseases such as cataracts and macular degeneration. Therefore wear UV blocking sunglasses to protect your eyes from harsh sunlight. The best cure for eyestrain is to give the eye muscles a rest. i. Take frequent breaks from whatever you're doing. ii. Close your eyes and give them nothing to look at for a while, or stare off into the distance for a mument. iii. Room lighting should be diffused, not direct. The major eye-disease risk for people with diabetes is diabetic retinopathy, in which abnormal blood vessels grow across the retina, damaging and sometimes permanently destroying vision. Diet, medication, and exercise are the key to controlling diabetes and reducing the risks of retinopathy. Most forms of cataract develop in adult life. The only effective treatment for cataracts is to have them surgically removed. In order to lower the risk of cataracts or slow down the formation of cataracts one must get regular eye checkups done & include a healthy diet comprising of dark green leafy vegetables & fruits rich in Vitamins A, C & E.
It is a medical condition that is commonly seen in elderly people which results in irreversible loss of central vision. i. Incorporate dark green leafy vegetables in the diet. iii. Quit smoking - as smoking impairs the body's circulation, decreasing the efficiency of the retinal blood vessels.iv. Use low vision devices like magnifying glasses, special high power reading glasses. To prevent hypertensive retinopathy, a person with high blood pressure needs to control it by modifying the diet, exercising, and following medications as prescribed by the physician. Detecting the problem early arrests further damage to the eye thereby improving the chance of a successful treatment. 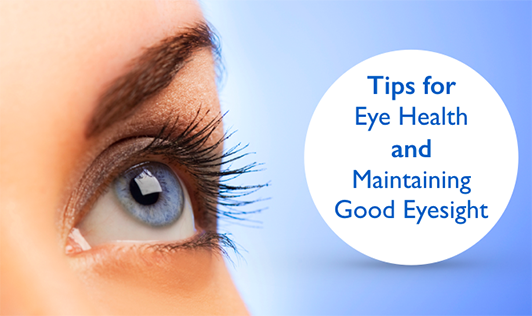 It is always advisable to visit your ophthalmologist periodically.